Another way I think about a globally-inspired home is one that's collected. Collected over time, during travels around the neighborhood or globe, throughout memory-making and life-living. The pieces that tell the story of the lives who make this house a home. Some of the most meaningful pieces in our home are those collected during shared experiences with the ones I love, and somehow this has a way of making them that much more beautiful. And for me, many of these pieces happen to be textiles, which is our theme for week two of creating a globally-inspired home. My co-hosts are Stephanie of Casa Watkins Living and Corinna of A Designer at Home. Last week, we talked about the first layer in creating a collected look: furniture. I shared that in our small home, sticking with classic, more streamlined furniture (at least the larger pieces) has proven to be a great base for my penchant to frequently switch things up! (I pretty much treat blue as a neutral, so to me this blue daybed is completely classic and versatile!) And, textiles certainly provide lots of room for flexible, creative freedom. 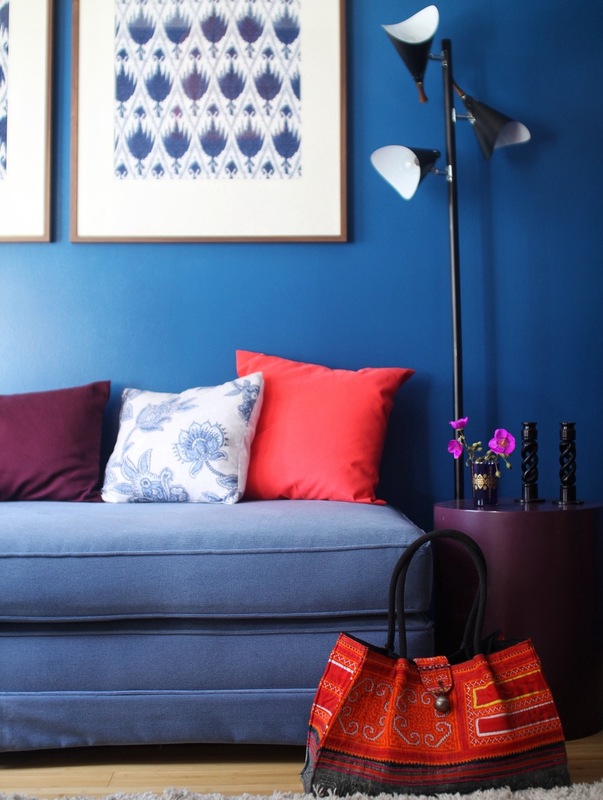 This blue wall + blue daybed and pillows provides a lovely scene...throw in the Thailand tote and suddenly you have new energy, personality. This bag travels around the house as a decorative accent, almost like a piece of art. Think outside of the box! Sometimes, I'm feeling more maximalist and will pile on the pillows for a layered, pattern-ful mix. And other times I need to edit, edit, edit... but for me, this definitely doesn't mean all neutrals. Pairing a more modern, geometric print with busier patterns is a great way to freshen up the mix. I'm all about casual, simple decorating that works for real life. Craving some bright colors for summer? No need to paint a room or take on some other big project... pull out your most colorful blanket and throw it over a sofa or a chair for instant sunshine! I've been working on painting our front hallway - from green walls with glossy black trim to all white - and although the space needs to include some storage and function as our entry area, I'm trying hard to keep things feeling calm. One solution has been to simply drape this fabric over our shoe-cubby storage bin. It's like a breath of fresh air! I may eventually hem it and/or add some tailoring, but for now the casual look is working for me. When thinking about textiles in a room, rugs are a key player! I love a good colorful, patterned rug but tend to use them in our home in small doses - again, it just works for me to keep the larger pieces more classic to allow for frequent rotation of furniture, art, accessories, etc.! This rug definitely lends global flair although in a more subtle dose, giving the room some breathing space and allowing the other room elements to shine. I encourage you to take a quick look around your space with new eyes. Is there a tablecloth, blanket or even just an un-hemmed piece of fabric you could repurpose for a quick refresh? And don't forget to visit Stephanie and Corinna for more creative textile ideas!